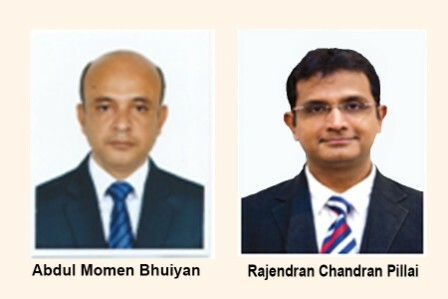 Staff Correspondent: Apex Footwear Limited (AFL) has appointed Abdul Momen Bhuiyan as Deputy Managing Director (DMD) and Chief Executive Officer (CEO) of its unit 1 and Rajendran Chandran Pillai as the CEO of unit 2. He joined the AFL in 1995 and has been serving in the position of the DMD since 2012. He has been providing leadership in the export business of the company and driven its growth in recent years. Mr Bhuiyan completed his MBA in Finance from IBA, Dhaka University and BSS in Economics from University of Chittagong. He currently serves on the Board of Directors of Blue Ocean Footwear Limited, Landmark Footwear Limited, and Apex Investments Limited, said a media release. He is also the Senior Vice President of Leather goods & Footwear Manufacturers & Exporters Association of Bangladesh (LFMEAB). On the other hand, Mr Pillai was serving as the Chief Operating Officer (COO) of the AFL since 2014. He served as the president of the Indian retail chain Being Human. Mr Pillai is a Retail professional with over 25 years international experience in India, the Middle East and Bangladesh. He holds an MBA in International Business from the Indira Gandhi Open University, India.